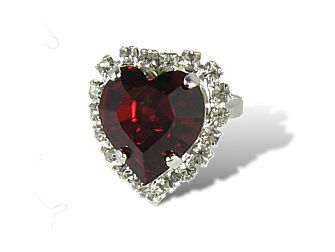 This sparklng and oh-so-romantic ring features a ravishing Swarovski crystal ruby red heart, meticulously cut and polished to reflect every ray of light, then surrounded by a shimmering border of crystal clear Swarovski crystals. Adjustable to suit most fingers. Adjustable. Heart Size: 2cm x 2cm.